In recent weeks, the hardline, conservative government of President Park Guen-hye in South Korea has been openly attacking union rights through regressive labour legislation, violence, the arrest of trade unionists, and the criminalization of legitimist democratic protest. On November 14, police used water cannons and tear gas as tens of thousands rallied against the Trans-Pacific Partnership trade agreement and new labour legislation that makes it easier to cut wages, dismiss workers, and create precarious work through the use of temporary employment agencies. The government is also trying to arrest union leader Han Sung-goon of the labour central KCTU (South Korean Confederation of Trade Unions), and has raided union offices and arrested workers. Recent comments made by President Park Guen-hye comparing protesters to terrorists and claiming that protests are a security risk have come under fire from activists, workers, academics and the media. 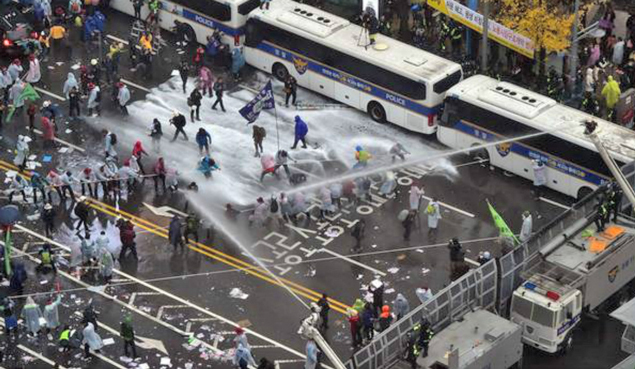 The Confederation of Canadian Unions calls on the government of South Korea to respect the rights of freedom and association and freedom of assembly, and to refrain using violence against demonstrators, the arrest of trade unionists, and the criminalization of political dissent as tools to forward its right-wing trade and labour polices under the guise of national security. We pledge our solidarity with the South Korean trade union movement and with all workers in South Korea. An injury to one is an injury to all.